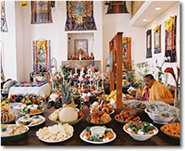 "Portraits of Tibetan Buddhist Masters"
Weekly Worship Services begin at 9:00 am on Saturday mornings. The Discussion Group meets at 8:00 a.m. before the Worship Service. The discussion centers around a book that we collectively read, and is designed for anyone interested in talking about Buddhism thought and practice. Everyone is welcome to attend both the Discussion Group and Worship Service! This is a focused discussion group on the basics of Buddhism. Using His Holiness the Dalai Lama's text, The Way to Freedom, this class is designed to introduce everyone to the fundamentals of Buddhism. Directly following the class, we conduct a sadhana practice. This is a meditation practice for all levels of Buddhist practitioners, so please join us. It is recommended that you bring a small offering for the shrine and also your practice books. If you need to purchase one, they will be available to purchase. For additional information please Email Linda at linda@odn-usa.org. Everyone is welcome to attend the Worship Service! 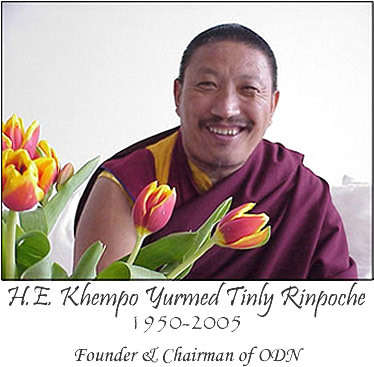 ©1997 - 2011 Osel Dorje Nyingpo Organization. All rights reserved.